So as part of coming back, I've got the time and mental space to finally write about my last few weeks in the Solomons. I would have to say that, being in the cold, planned and organised world of New Zealand, I miss many things about the Sollies. One of them is the chaos factor. Every day I walked down the street, something always made me laugh, made me slightly afraid and made me want to cry. Mostly these emotions happened at different times. But when those things come together, its a beautiful thing. 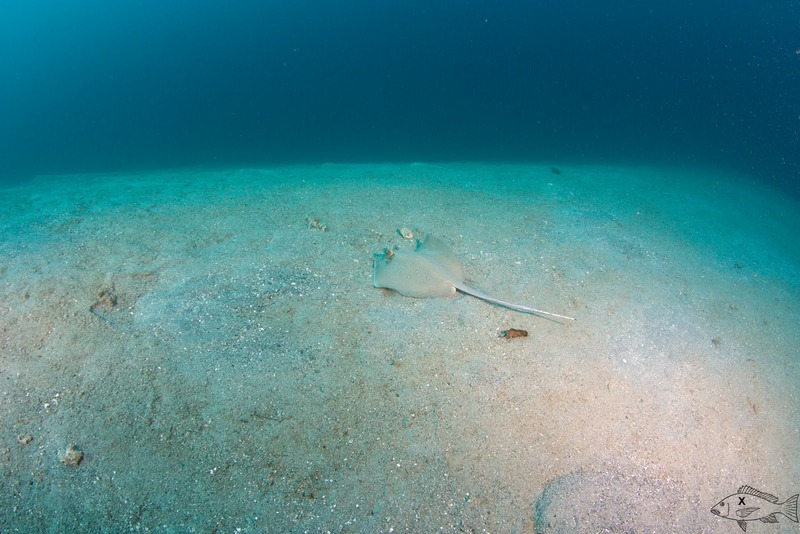 And the most common place I expereinced them at once in the Sollies was while diving. 1. Sit at the bottom until things become clear: Look, I think we all know that life can be a confusing mess of crappy emotional issues. Sometimes we just can't see straight when we are going through things. Some of us fight on, blindly swimming forward. Others try to swim out of it. Mostly, what you find is that the more you fight or the more you run, the cloudier the emotional waters get. So, I learned to sit and wait till the cloudy water settled. I remember sitting down at the bottom of the ocean floor and, in almost zen like position, just waiting until it was clear enough to see. I guess, coming back here, I've had to do the same thing. There has been quite a bit of movement and upheaval and though my new job requires traveling, I've asked to stay put for awhile in Wellington. I am waiting until the water becomes clearer and I can see more clearly where I am going. Now, this is a new thing for me cause mostly I would just power on through and say I was fine. So I've learned. Me, looking up at the sun. 2. Your buddy will save your life, so choose a good one. Most people in the diving fraternity will agree that, as important as it is to chose good gear, its more important to chose a good dive buddy. A good dive buddy will watch your back (literally) for sharks and all kinds of nasties. Your buddy has the potential to also share their air with you should something go wrong with your gear. Your buddy can be your lifeline. 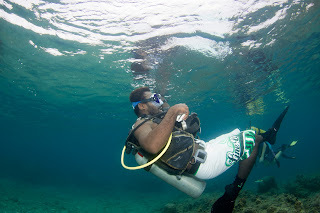 On one of my last dives, I got bad vertigo and was simply zoned out. 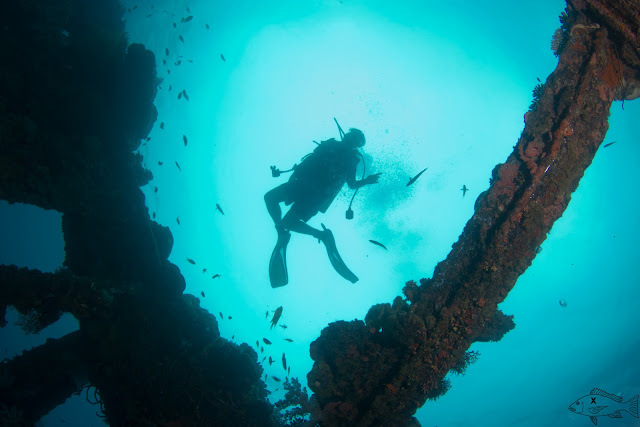 My dive instructor, Gabe, was watching out and pulled me away from a jagged piece of shipwreck that my head was on a collision course with. Twice. Maybe it was three times. Whatever, I was zoned out, on a high from a great Go Finis (leaving) pirate party the night before and was a complete bimbo underwater. My other dive buddies were just as mindful, getting me out of scrapes. 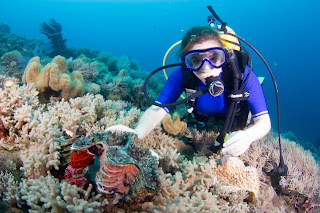 I was really lucky; all my dive buddies were awesome, trustworthy individuals who had my best interests at heart. But, as in life, we all make strategic errors in judgement. We trust people who shouldn't be trusted with our lives or our hearts. Luckily I never made that mistake underwater. And, now I pursue closer friendships than before and even recently, I had a friend, out of water, point out that I was heading on another collision course with another kind of wreck. It takes a good dive buddy to pull you away from a wreck. It takes a great friend to do the same thing too, out of the water, so thanks friend, you know who you are. 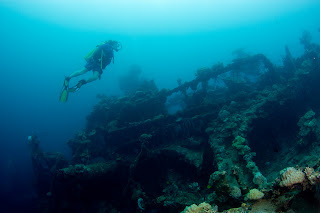 I was diving the Japanese submarine wreck off of Visale. Matt, an intriguing sort of fellow and his friend Todd, took pity on me and took me out to the wreck. We dove down and had a great time. Matt is the kind of great playful dive buddy that I love to dive with. He is engaging and fun, doing acrobatics under the water. You can tell he enjoys the feeling of weightlessness and makes great use of it. So yeah, Matt and Todd both put me at ease instantly and I get comfortable with the sea life. As we swim right over some unexploded torpedos, I get a sense of courage I don't normally have. I play. I engage with the sea life. I see a bunch of clown fish and go for the sea anemone. It stings the hell out of my arm. I know I'm hurt as even under the water, I can see the swelling come up. As we make it to the beach, Matt has to help me out of the water. The stinging is intense and my arm becomes a mess of splotchy swollenness. As we go to the next dive, the waves are up. I'm tired and cranky and in pain. I realise that I have a couple of options: hot water, vinegar, more salt water or urine. Now, there is no power points at the beach, so boiling ye olde jug is out of the question. As is vinegar, I left it at home in hopes of making a great salad dressing later. Salt water seems to have no effect. So, finally, I crumble. The arm must be peed on. Now, one of the great things about obeying rule #2 of diving (see above under choosing a good dive buddy), is that a good dive buddy steps up and says "Yo, Sara, I'll pee on your arm". I shake my head and say no, its a lot to ask of someone to pee on you. "No, I actually have to pee really bad...." I sigh, sad to dissappoint the boys. "No, if someone is going to pee on my arm, its me," I say, to slightly disappointed faces. I think its mostly because everyone loves a good peeing story. So the boys shuffle off into the water and sink below the waves, leaving me to my task. 4. You can only worry about what you can see. This one I learned whilst night diving. Night diving is still one of the scariest and funniest things I've ever done. 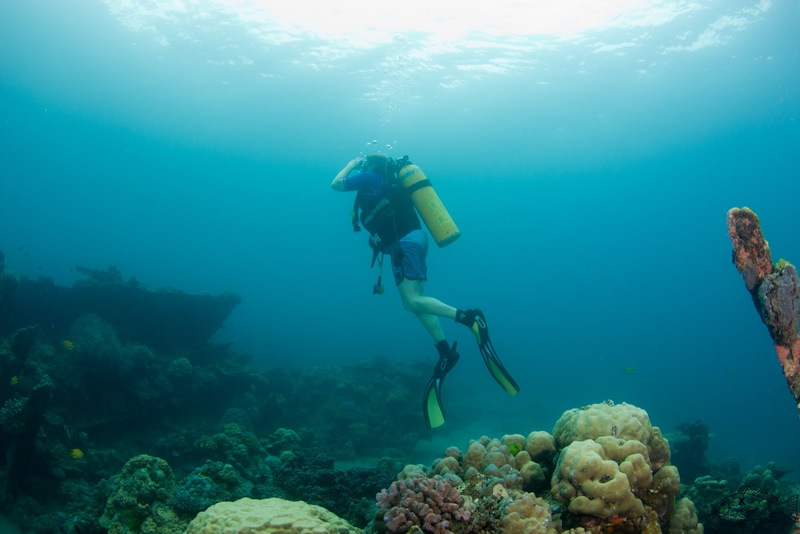 It limits our power of sight and without much sound underwater, add the feeling of weightlessness and its akin to being a sensory deprivation tank. With sharks and all many of nasties you can't see. But the great thing about night diving is that after a little while, you stop worrying about what you can't see. Your torch can only shine light into the abyss to a certain distance and after that, well...it could be Jaws for all you know. I waited for the big shark to come and...well...I never saw it. So all that fear, that anxiety, was for nothing. So I guess, my experience is that if the big shark is coming for you, it will come; there is no need to worry about it because I would have missed seeing the cuddle fish change from a cruisey sleepy blue into an angry violet when we woke it up. And so on. 5. The sea always changes so let it. I think nothing taught me more about change than seeing buildings, like the Christchurch cathedral, in ruins. The things we rely on, the structures and the relationships can crumble and change in a moment. One of the ways I came to find peace in the chaos was developing a better understanding about change through diving. I used to dive Bonege 1 and 2 on a regular basis and instead of getting bored, I became fascinated with how it changed each time I dove it. Fish and sea life react differently depending on whether its morning or night, whether its rainy or clear. The wrecks themselves changed too, as the sea finally took its toil and rust and weight of coral moved the metal. Every time I got out there, I marvelled out how different it was, day to day, week to week. Its what made the diving interesting and in a way, all these changes make life interesting too. Because who wants to be bored? Being safe and secure is great but, for me, it isn't really living. So yeah, change can be a beautiful thing, especially when you can take a moment to appreciate it. Spot the blue spotted ray. ﻿6. Don't panic. I've been deeper than I would care to admit while diving. And well, I've been slightly dumb at times, often being overly optimistic about a situation and not looking closer at a situation. What I've learned is that panic can kill you. When people panic while diving well...it ain't pretty. Essentially, all kinds of bad stuff can happen to you, so its better to be as relaxed as possible and calmly make small changes if possible. 7. Enjoy the moment. If one thing diving has helped me out with, its to enjoy the moment. Working in disasters, I'm always trying to predict what's next, what the worst case scenario is and honestly, it can be exhausting. But when I dive, all of that goes away into a beautiful blue haze. This is kind of like number 5 re: change but its also about relaxing into it. I found the more present I was, the more relaxed I was. The more relaxed I was, the more the fish seemed to just hang out with me. It got to the point that I felt so relaxed in my watery environment that when I got out of the water, it felt foreign and difficult on land. I much preferred my watery existence; weightless and floaty, to the harsh realities of life above the waves. In a way, thats how I feel about coming back from the Solomons. I feel like the Solomons, with its warmth and relaxed way of life, was a much easier life to navigate than the cold streets of urban New Zealand. Here, I've adapted by enjoying the moment as well. I stop and look at old buildings or trees. I marvel at all the men in suits and women in high heels roaming our nation's capital. I try to find the moments and fill them with wonder but its hard. Everything here seems to be geared towards future and past but there isn't a lot of people who celebrate the moment. So I started climbing again because I find climbing very focusing. While its not diving, I have to be focused on what I am doing in that moment. 8. You are never alone. 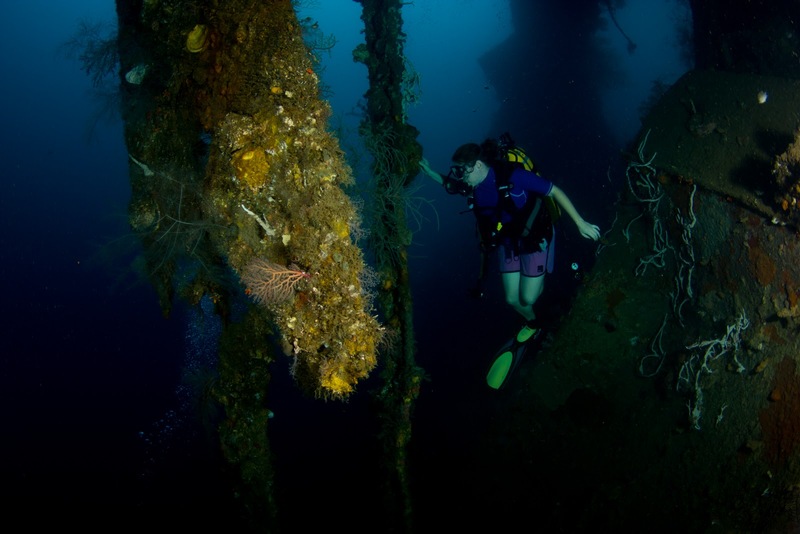 I think one of my favorite moments came at the very end of my diving life in the Solomons. It was my last night dive with my great dive buddy Jo. It was raining down and you could see the droplets of water splattering down like liquid diamonds about six inches into the waves. As I looked up, Jo took my hand for a bit and just swam with me. We just enjoyed that moment together and we didn't need to say anything to each other (well we were diving so we couldn't) but I felt her support and friendship through holding her hand. It was a special moment for me, to feel a person's unconditional love and support under the waves, in the dark. When she let go, I could still feel that love, caring and support. It felt really wonderful and, even though I knew that the transition back to New Zealand would be hard, I would never be alone. And so endeth the lessons. 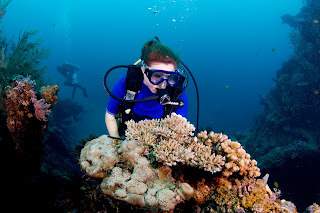 I could wax lyrically for hours about how much diving has changed my life...but that would probably be boring. After a month (today) of being away from the Solomons, I find the experience fading more quickly than I'd like it to. This blog here has helped a great deal to record those little moments that made my life so special there. And so...my adaptation to New Zealand life continues, as does the polishing up of my final blogs. I feel like I've got three more to go, so I hope you enjoy the final chapters of Stilettos in the Solomons. *All photographs are from the amazing Adam Hatfield, who taught me about diving and how to say "stop f*cking around" under water. Thanks Adam! How do you say "stop f*cking around" under water?